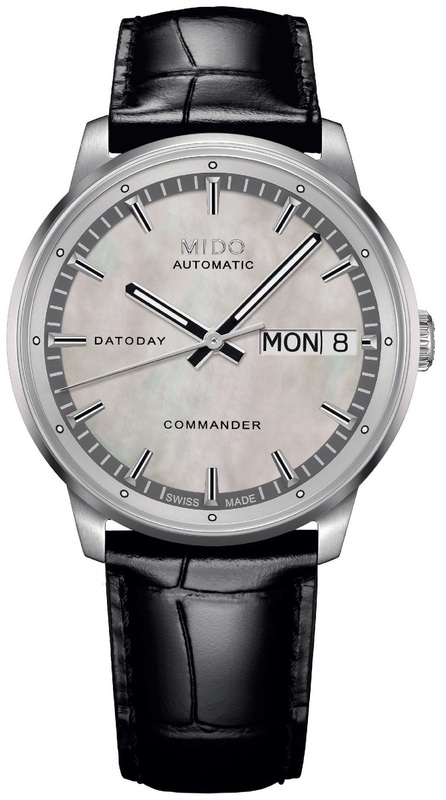 Swiss watch brand MIDO expands the Commander collection with the new model: the Commander Lady Mother-Of-Pearl. Like all models from Commander collection, this ladies watch beautifully evokes the curves and oblique lines of the Eiffel Tower. Equipped with an automatic movement, numerous aspects of this new model testify to a subtle evolution. A faceted and domed sapphire crystal protects the white mother-of-pearl dial, which lends a beautifully feminine touch to the Commander Lady Mother-of-Pearl. The faceted appliques are ingeniously reminiscent of the latticework of the Eiffel Tower. The Commander Lady Mother-of-Pearl is equipped with a finely decorated and elaborate automatic movement. With a diameter of 33 mm and water-resistant up to a pressure of 5 bar (50 m / 165 ft), it will appeal to every woman who admires fine watchmaking and appreciates Swiss tradition and expertise. The Commander has been given a new look, but retains the strong character so emblematic of the collection. The round satinated stainless steel case and polished bezel offer a discreet reminder of the curves and ironwork of the Eiffel Tower. A faceted and domed sapphire crystal protects the dial clad entirely in white mother-of-pearl, with hints of iridescence. The shape of the faceted and applied indexes calls to mind the latticework of the Eiffel Tower. They are treated with white Super-LumiNova®, as are the hour and minute hands, for easy readability at night. The Commander Lady Mother-of-Pearl is fitted with a black semi-lacquered leather strap. It is also available with a rose PVD-treated steel case and silver sunray satinated dial. Three additional full steel versions, with rose or yellow-gold PVD treatment and sunray satinated dial are also available. Automatic ETA 2836-2, 11½’’’, Ø25.60 mm, height: 5.05 mm, 25 jewels, 28,800 A/H, INCABLOC and NIVACOURBE shock-absorber, NIVAFLEX NO mainspring, NIVAROX II balance-spring. Finely decorated elaborate movement with blued screws, decorated oscillating weight with Geneva stripes and engraved Mido logo. Function HMSD+Day. Adjusted on 3 different positions for a high accuracy. Min. 38 hours power reserve. Satin-finished stainless steel 316L, polished bezel, Ø33 mm, 3 pieces, faceted and domed sapphire crystal, engraved serial number, water-resistant up to a pressure of 5 bar (50 m / 165 ft). Black semi-lacquered genuine calf leather strap with crocodile look and stainless steel folding clasp. White mother-of-pearl, faceted indexes individually applied, indexes with white Super LumiNova®, day and date at 3 o’clock. Diamond polished, hour and minute hands with white Super-LumiNova® for easy readability at night.